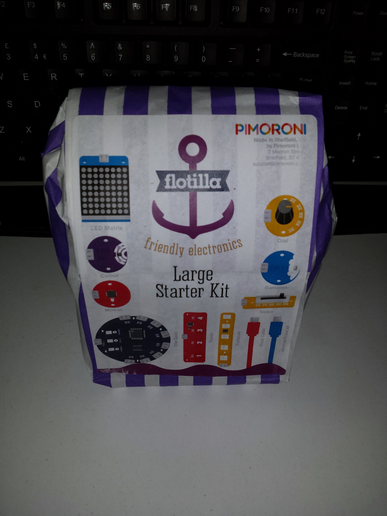 I signed up for the Pimoroni Flotilla Kickstarter campaign (it feels like years ago now! 😉 ) and when the hardware turned up, I didn’t have a Raspberry Pi handy. Yes, I could very easily have dug one out, but it gave me the idea – it’s a USB device, so why does it even need a Raspberry Pi? So, I plugged it into my Ubuntu PC, did a bit of light Googling (other search engines are available 🙂 ) and it turns out, that because those lovely pirates at Pimoroni like Open Source, it was very easy to make it run on Ubuntu, so here is what I did. 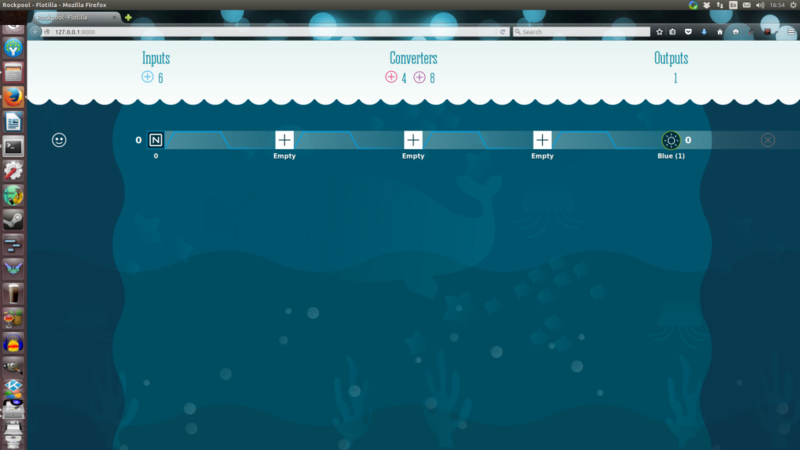 Rockpool provides a nice web interface to allow you to mess with all the flotilla hardware without writing any code. “Where’s the fun in that?” you might be thinking. OK, if you want, you can program it in python instead, but then this guide is not for you! Rockpool is fun, and it allows you to tinker very easily and get something up and running, which may be just what you want when you pull the Flotilla goodies out of their pretty bag (or impressive box, if you stumped up for the Mega Treasure Chest). Bet nobody’s ever made that joke before. The daemon is unfortunately only available pre-built for the Raspberry Pi, which uses an ARM CPU architecture, so we can’t run that on our PC which uses either Intel x86 or AMD64 architecture. So, we’re going to need to build the daemon ourselves. Fortunately, the source code is available, it’s written in C++ and has only a couple of dependencies, so we can build it ourselves easily. The first thing we need to do is download the source code from github. If you don’t already have git installed, you’re going to need to install that first. Open a terminal and type the following. Once git is installed, the following magic words will download the source code for the daemon. 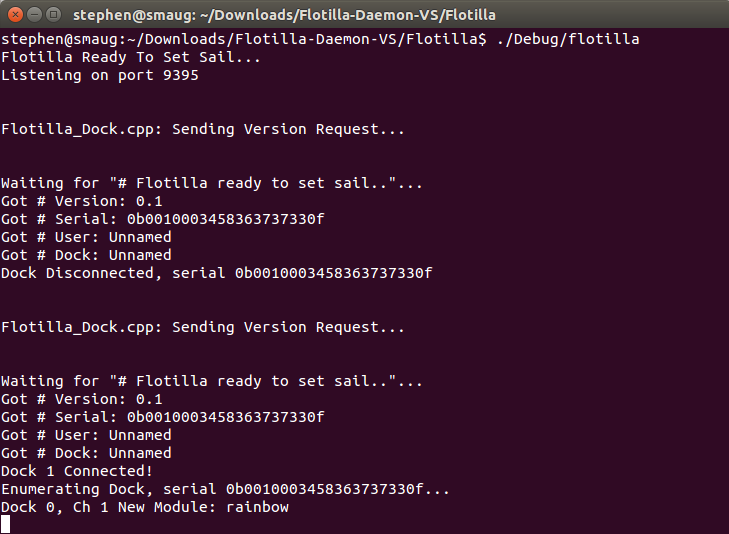 This will create a directory called Flotilla-Daemon-VS which contains the source code. Now, before we can build the source code, we need to deal with a few dependencies. Dependencies are libraries or other bits of code that we need to build or install before we can build or run the daemon. The first is libserial. Unfortunately, the version of libserial currently available from the Ubuntu repositories isn’t quite bleeding-edge enough for the daemon, which needs really up to date code, which supports opening a serial port for bidirectional communication. However, the source code for the version we do want is included in the daemon source folder, so, let’s build it. These are a couple of build tools, from the standard Ubuntu repositories, which are needed for building the software. Now we can build the daemon, although there is a slight error in the Makefile which we need to correct first. A Makefile tells the compiler what to build and in what order, and there is an error in the link order in the file on github (at the time of writing). If you do, great! It worked! If not, check the instructions above and make sure you didn’t miss anything. If you have trouble, post in the comments, and I’ll see if I can work out what went wrong. Now we’ve got the daemon running, let’s run Rockpool. We’ll need to open a new terminal window for this, because our first one is busy running the daemon for us. The python script will start the Rockpool web server on our machine, and then it will launch the web browser to show us the Rockpool interface. You should see a “Connect” button on there. Click it and it will connect to the flotilla daemon, then you’ll see the main Rockpool interface and you can play! I don’t understand why they didn’t already do this if was was relatively simple to do. Well, you’ve saved them a job. I think they’re just a bit busy, Tony, and supporting running on the Pi is their immediate priority.